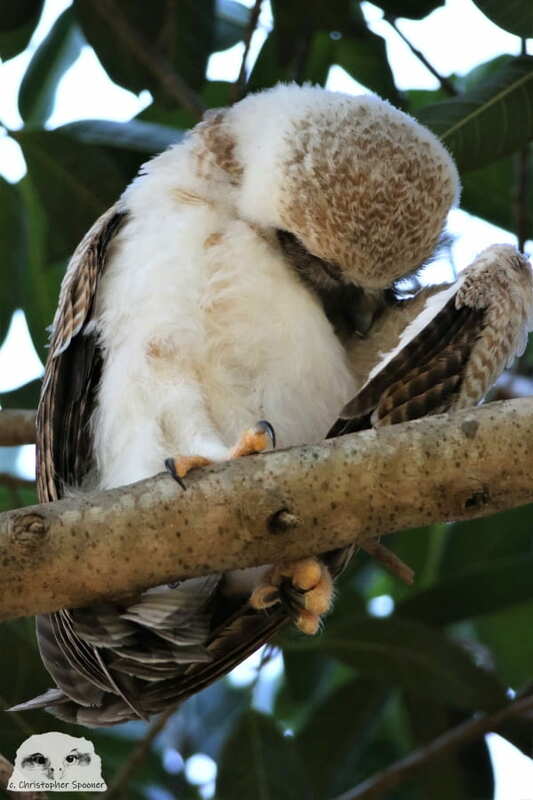 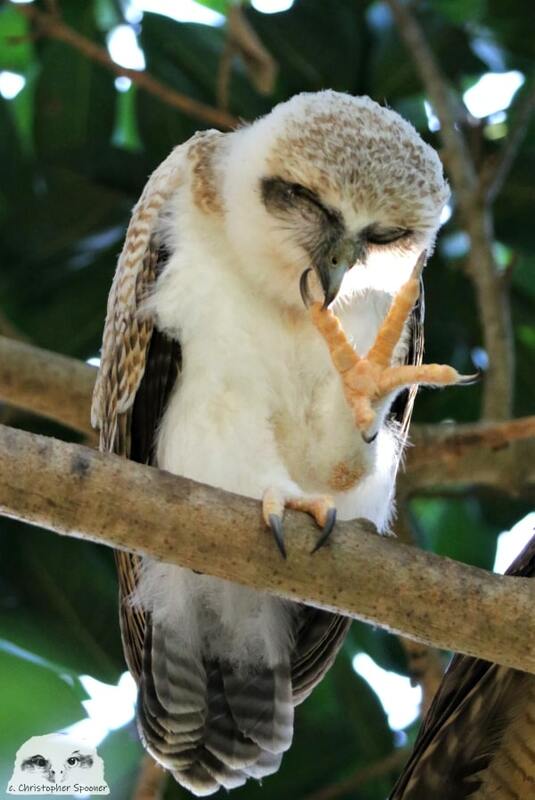 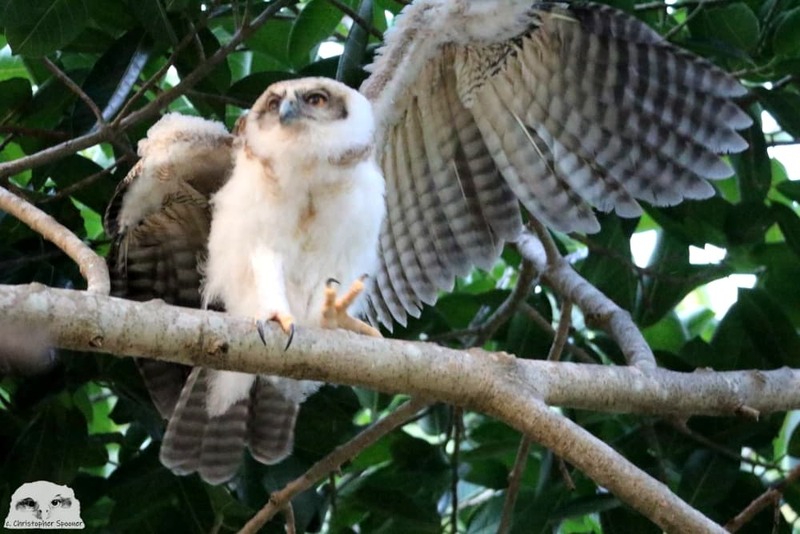 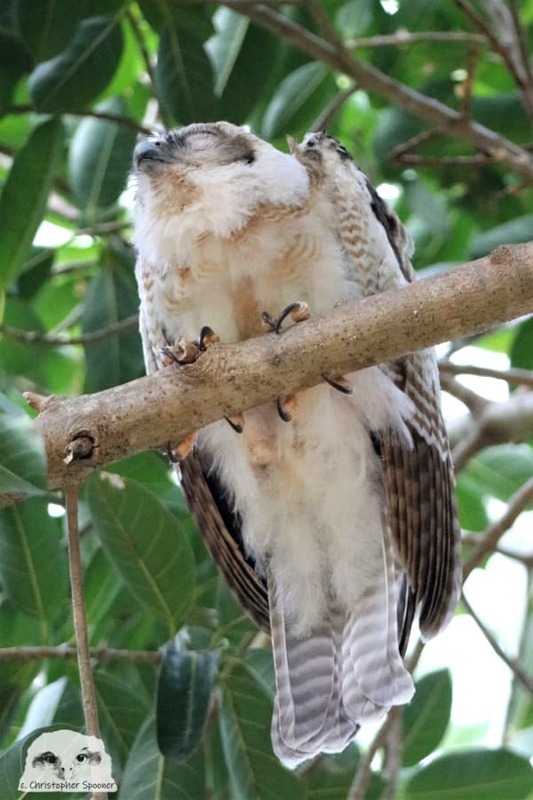 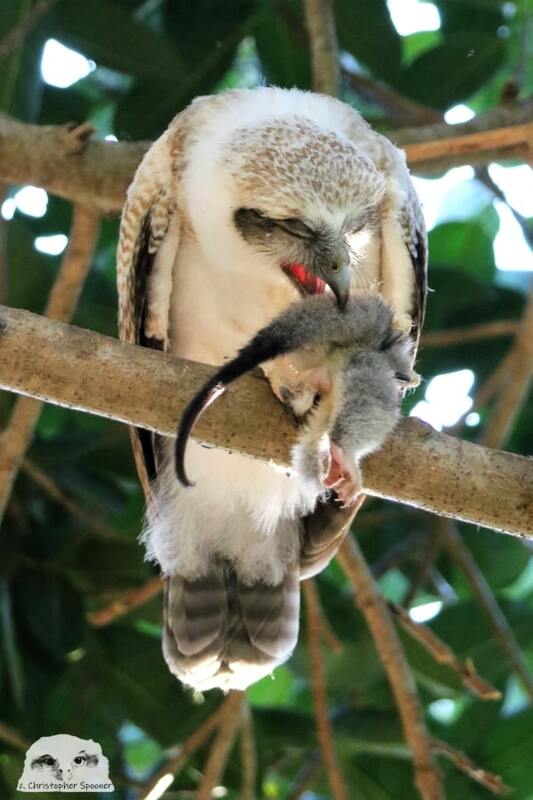 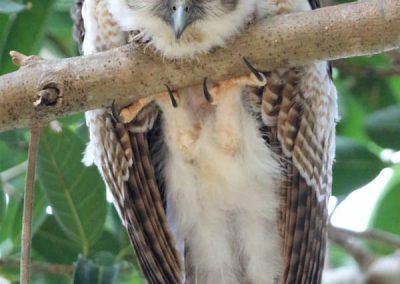 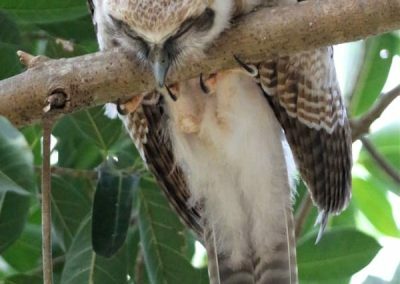 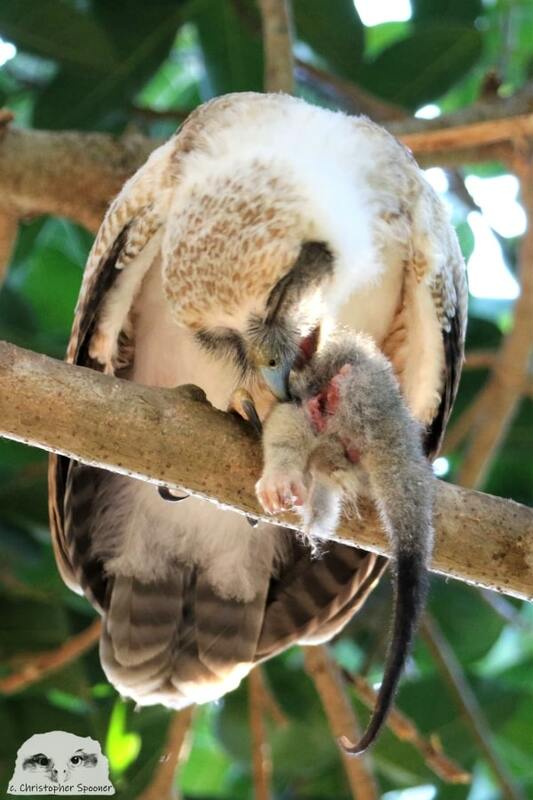 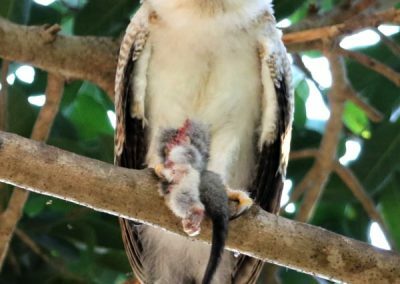 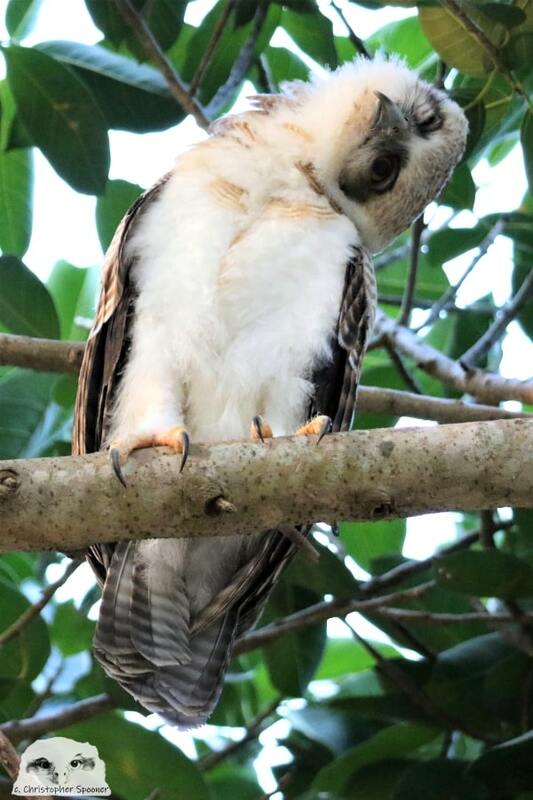 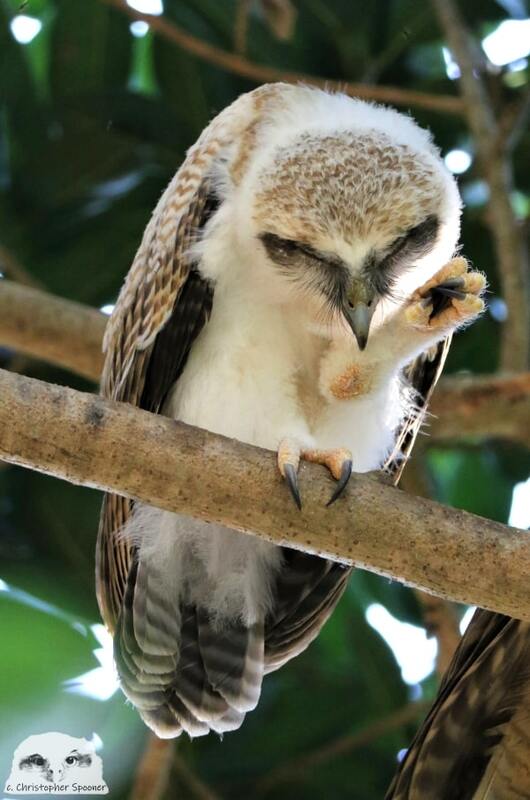 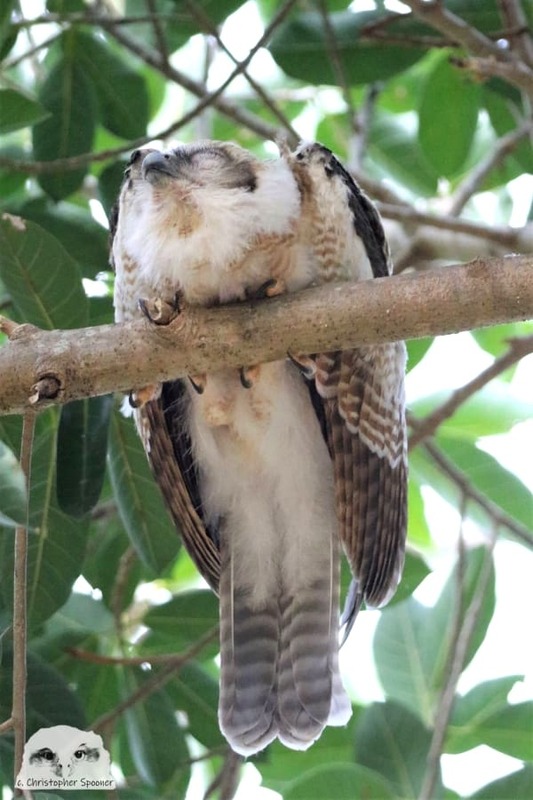 A rare photographic record of the growth of a baby Rufous Owl Ninox rufa, from hatching to independence, in Darwin, Northern Territory Australia. 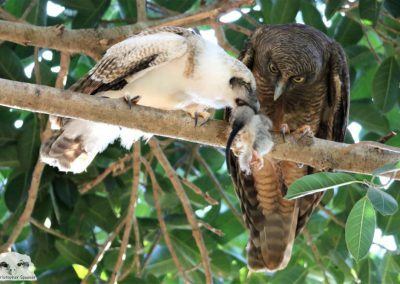 Meeting other locals is one of the great things about running wildlife tours in remote and regional Australia. 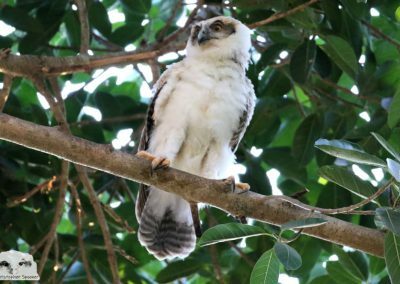 On a recce before a Wild Top End tour recently I bumped into a man taking photographs of birds on the East Point Mangrove Boardwalk. 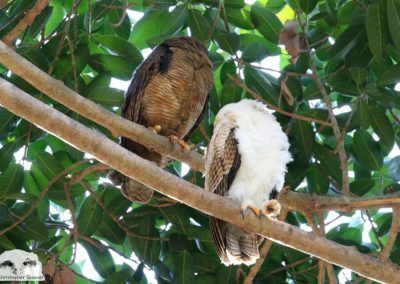 We started chatting, realised we had seen each other’s posts on a Northern Territory birds group, and exchanged contact details. 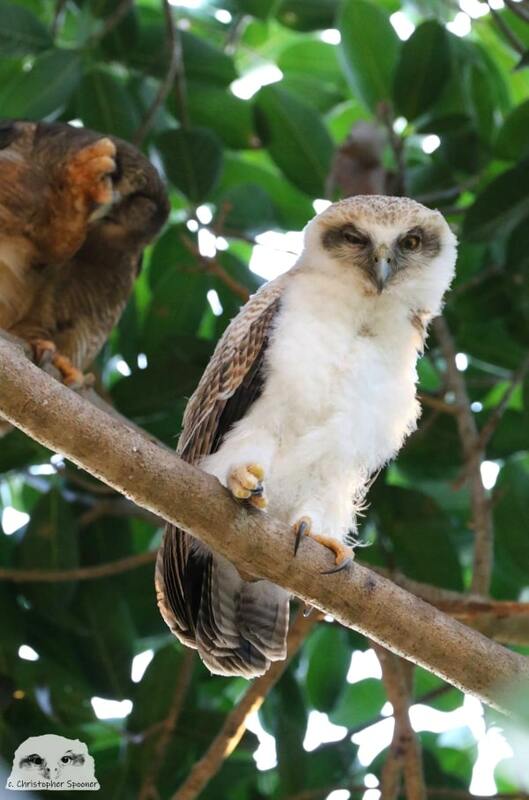 One thing we had in common was a fascination with the pair of Rufous Owls residing near Darwin. 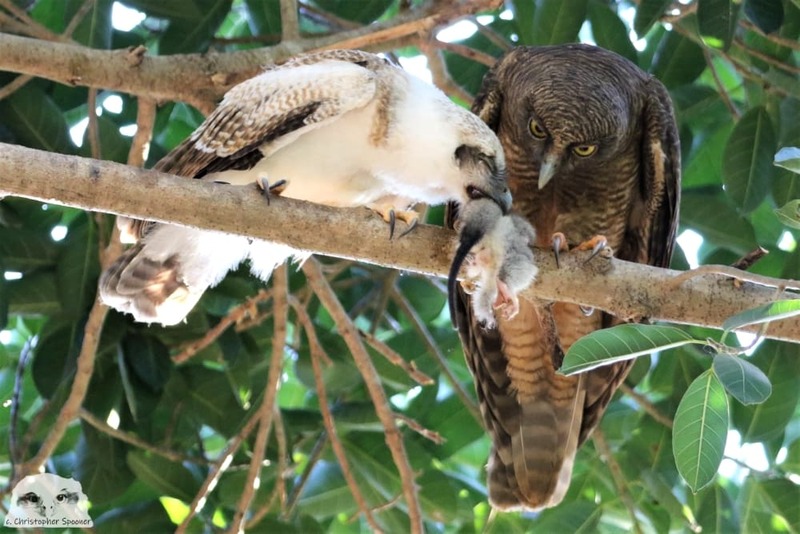 That pair had produced a chick, to the great excitement of many tourists and locals. 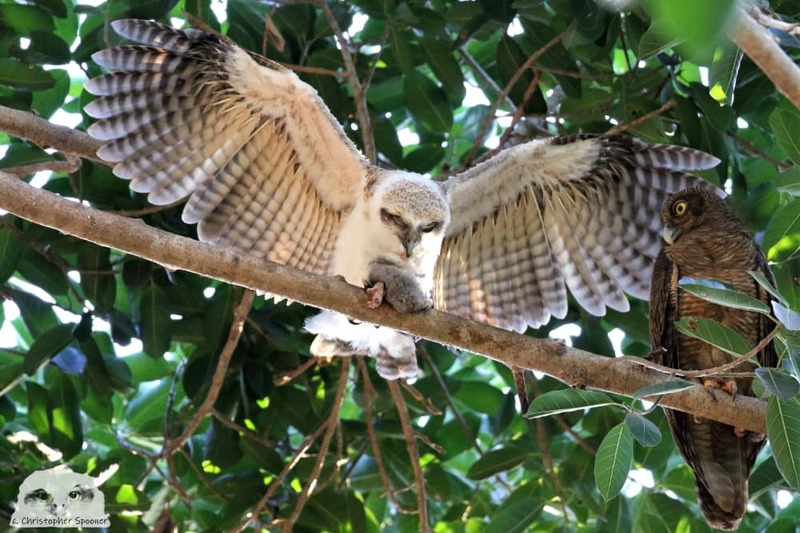 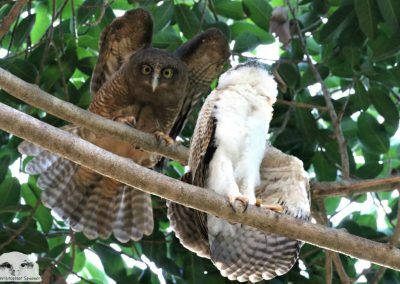 Read about the reasons for our excitement at seeing the Rufous Owl adults earlier that year. 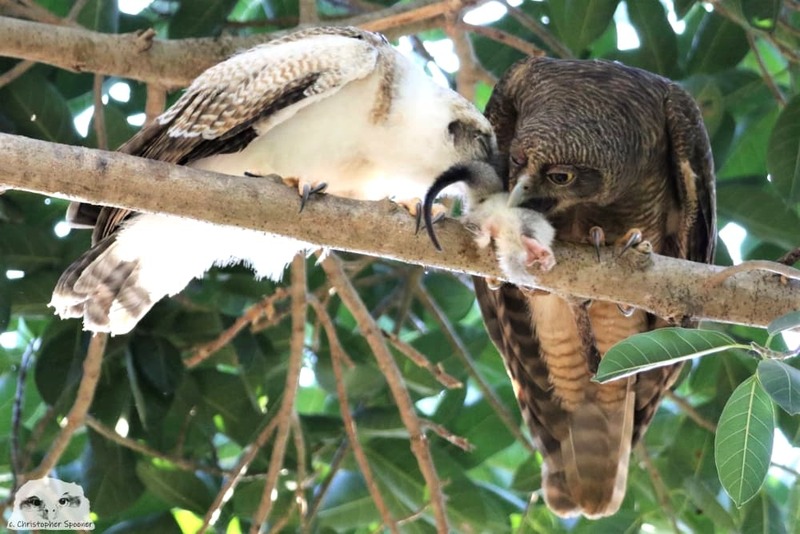 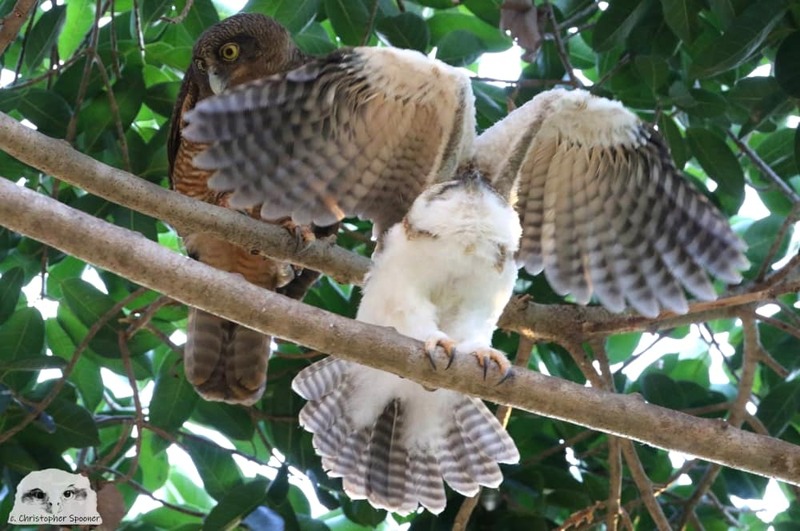 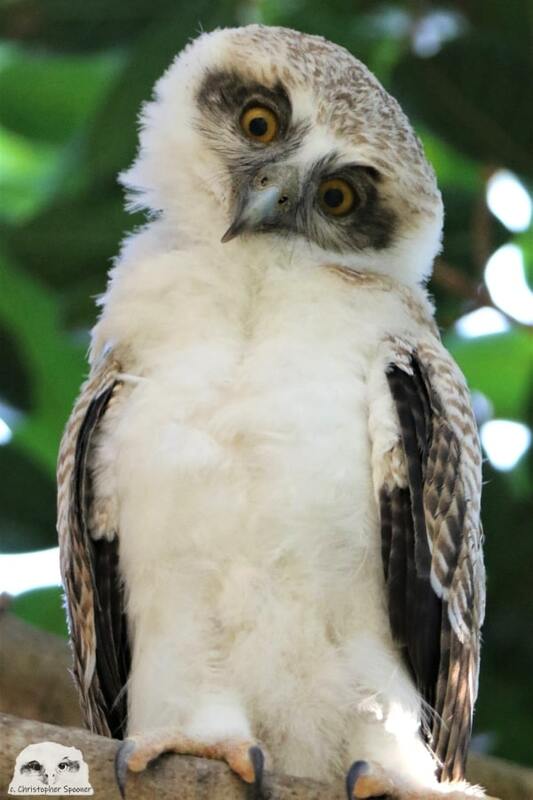 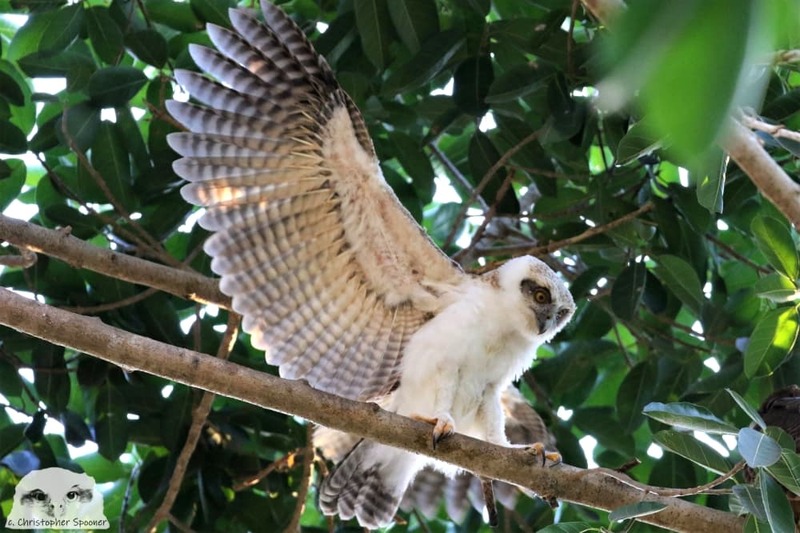 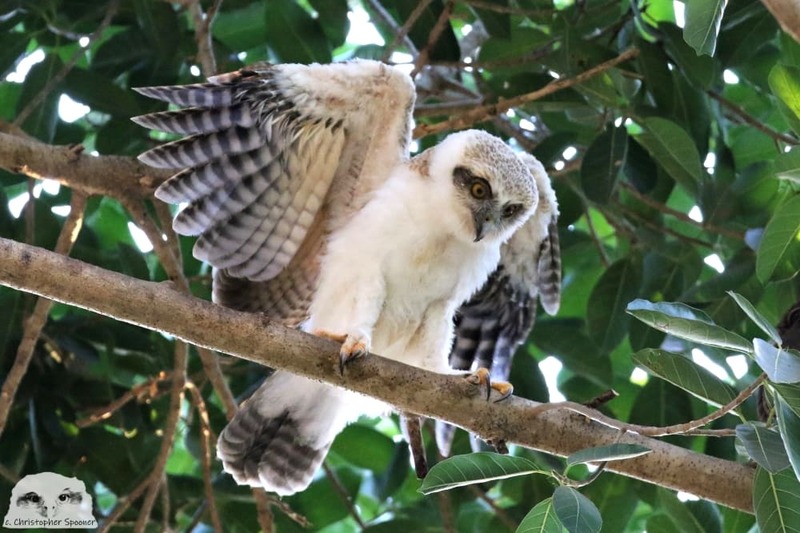 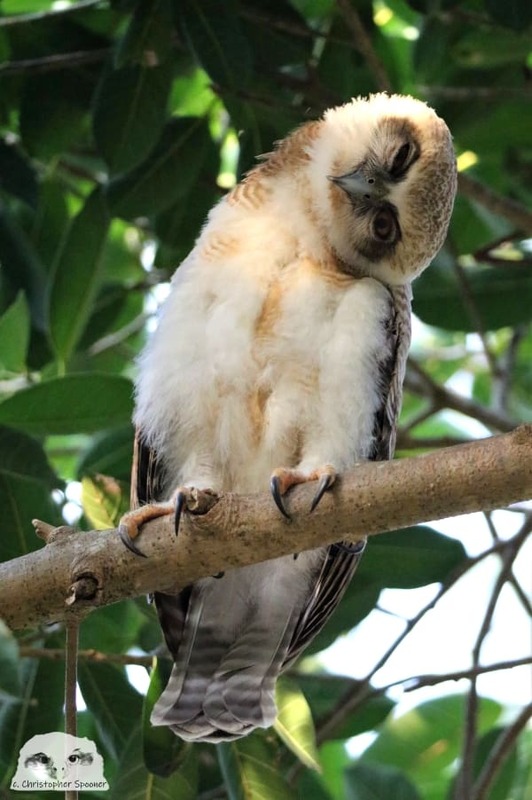 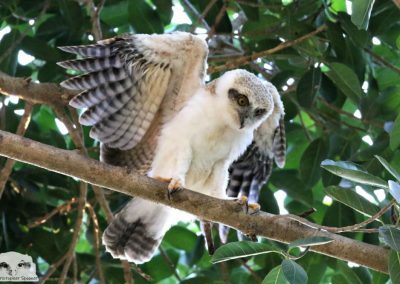 Over subsequent months that photographer – Christopher Spooner – shared the most delightful series of images of the Rufous Owlet growing up near Darwin. 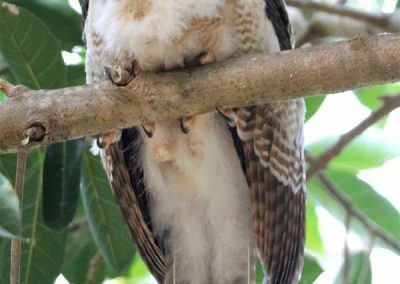 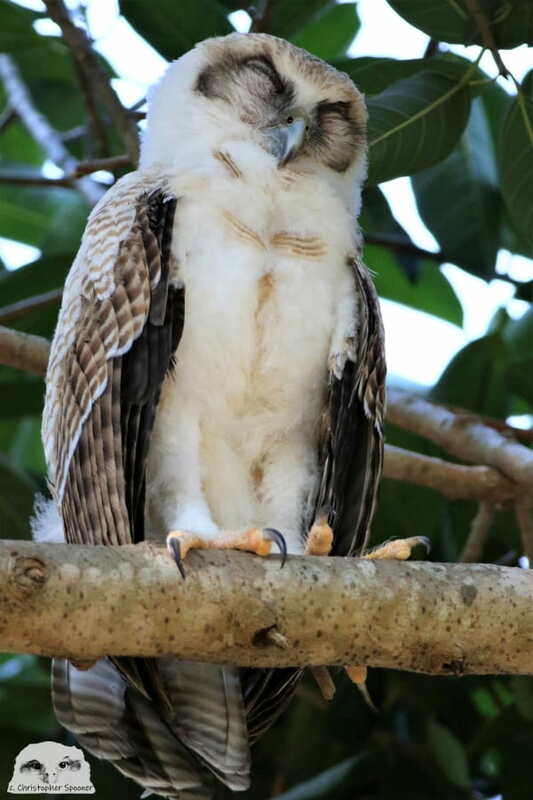 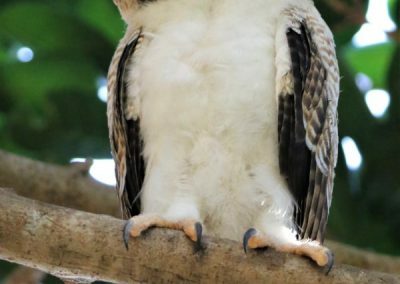 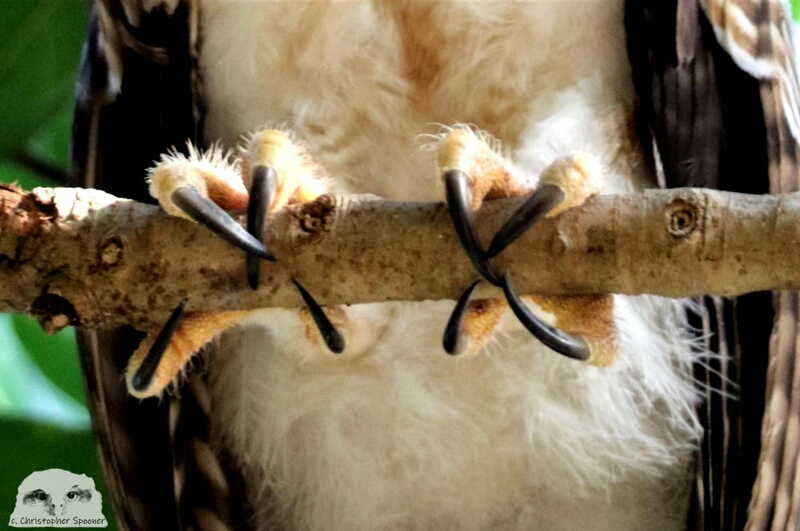 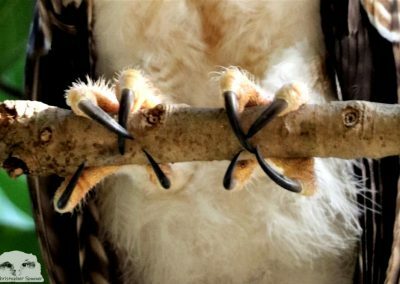 His images are so detailed, and his visits so regular, that he has provided an important record of the growth of this spectactular, rare raptor chick. 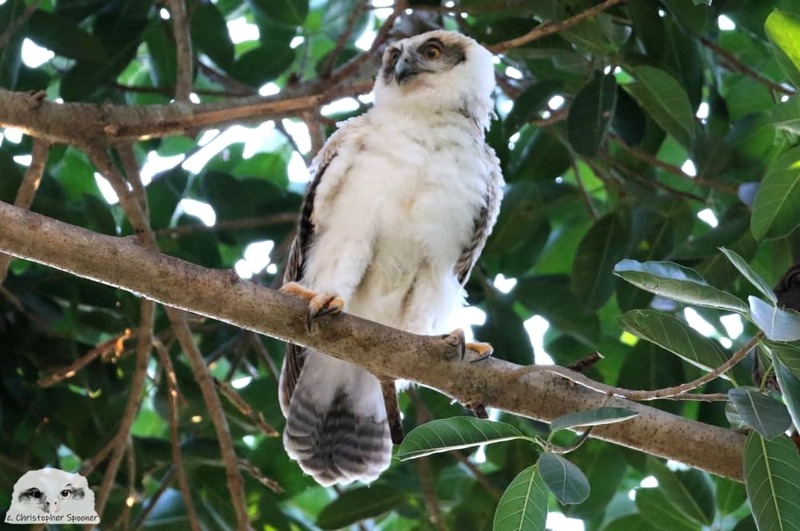 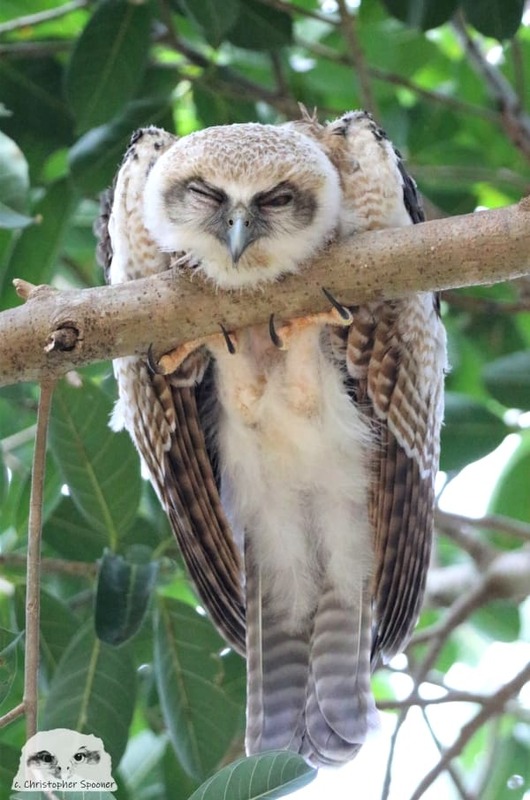 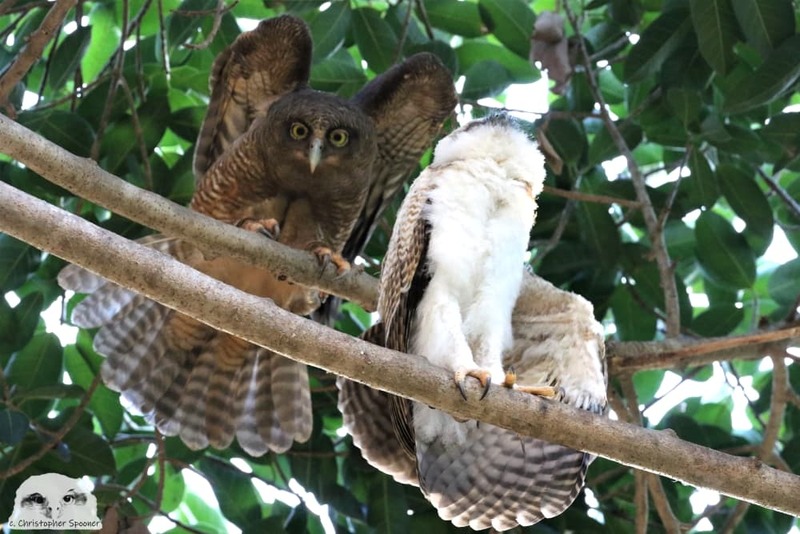 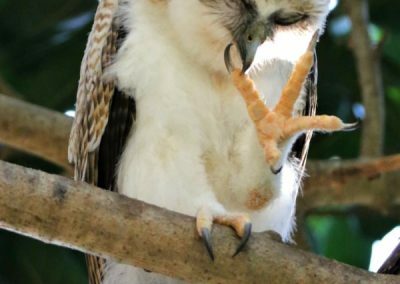 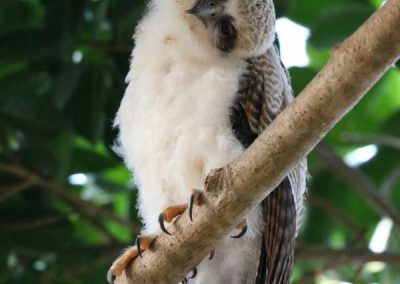 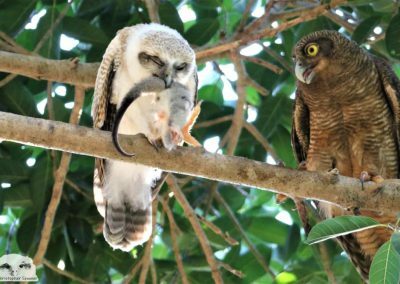 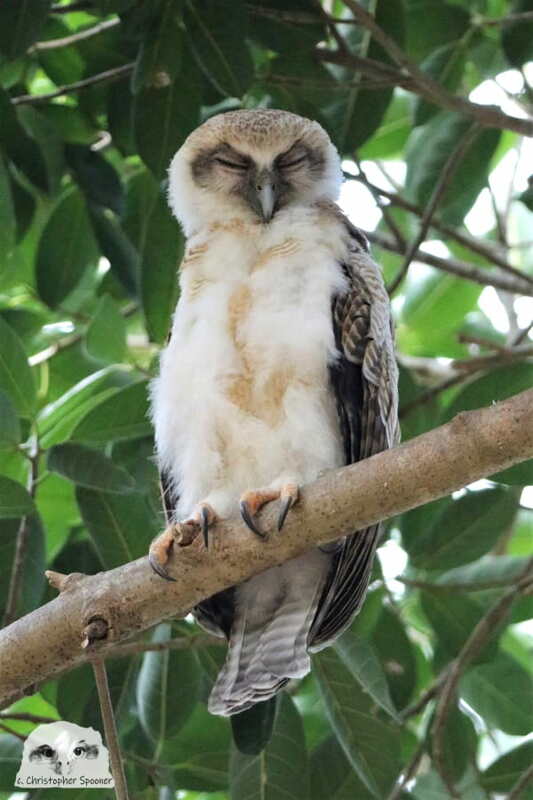 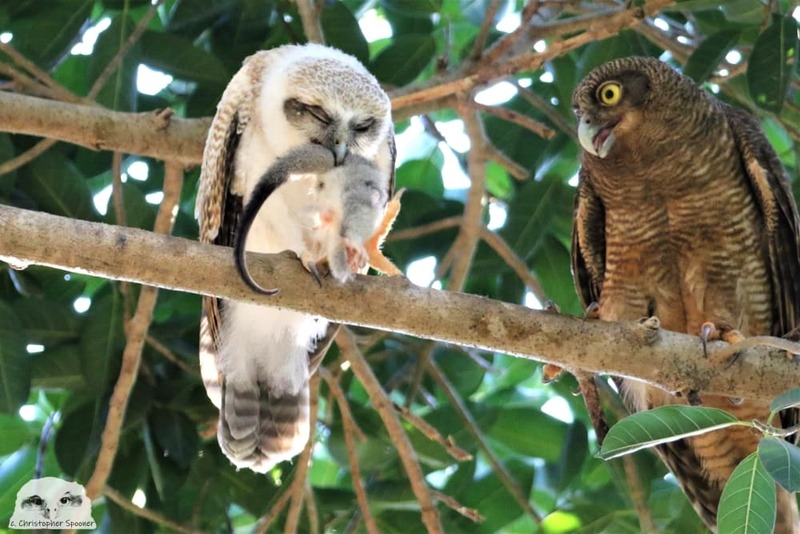 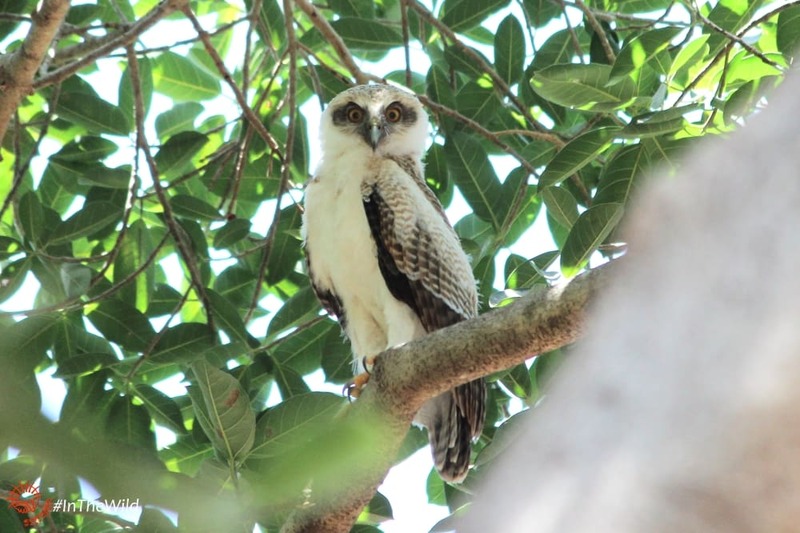 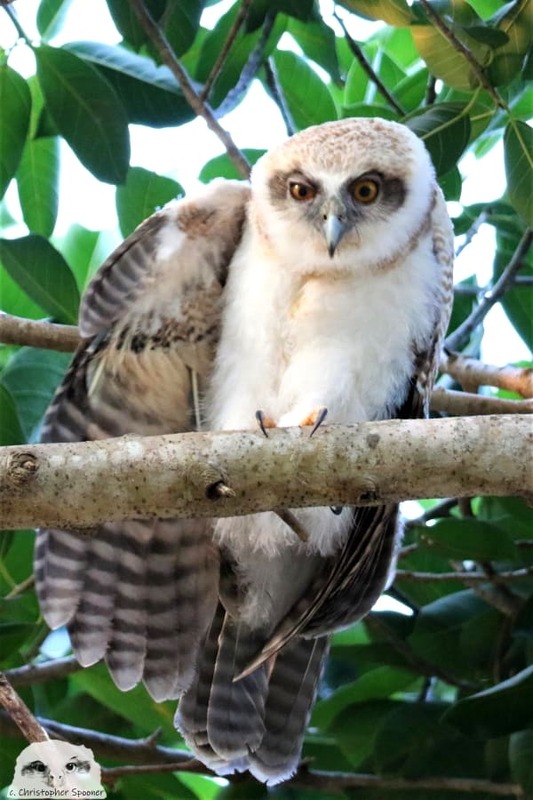 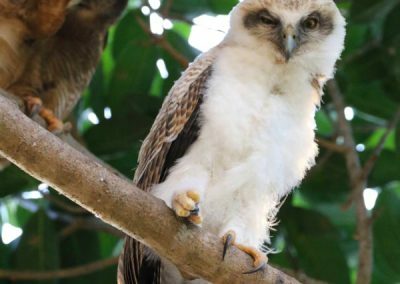 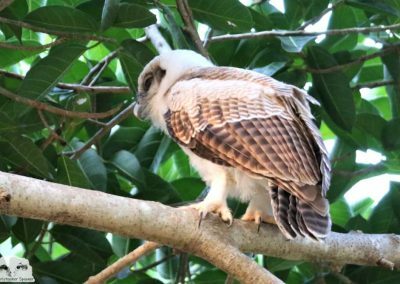 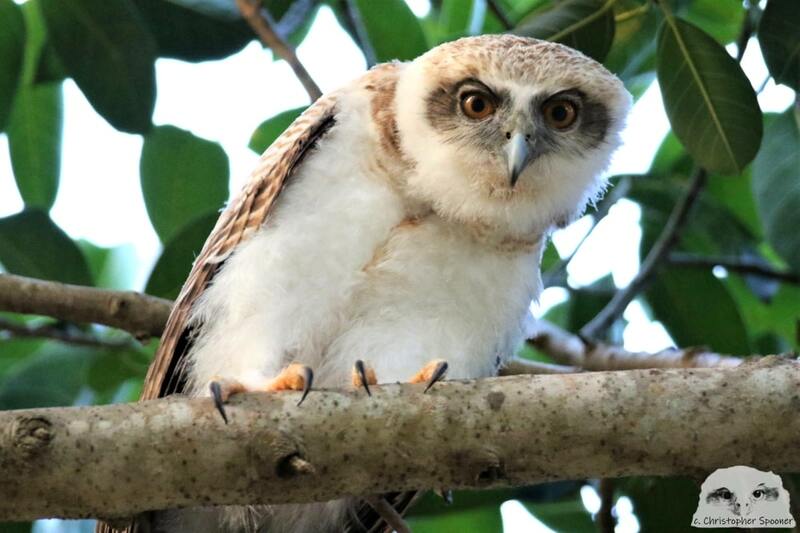 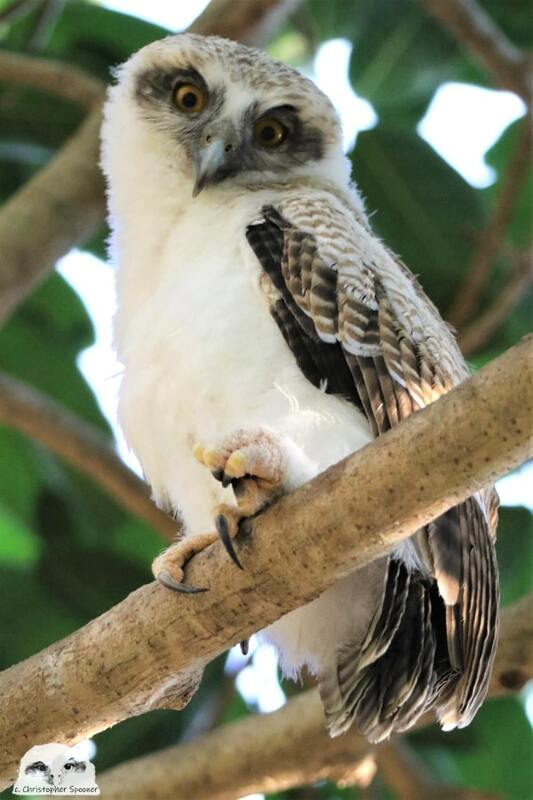 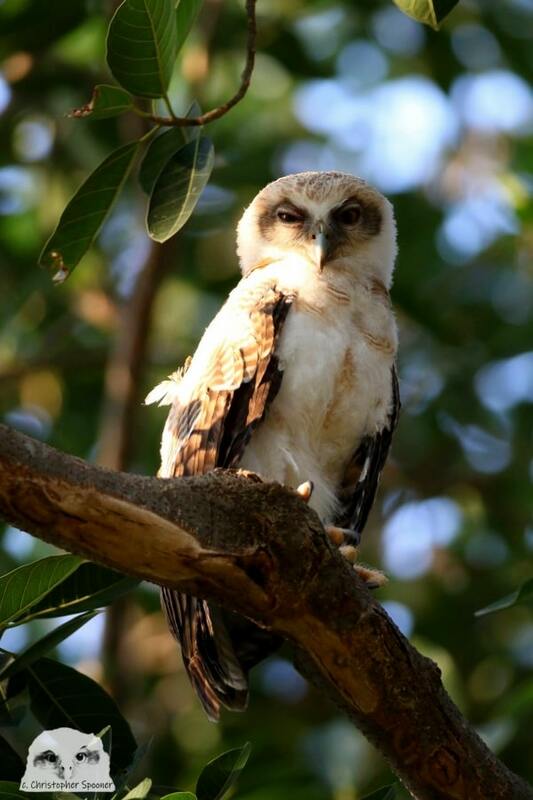 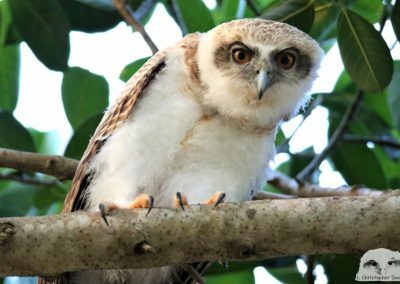 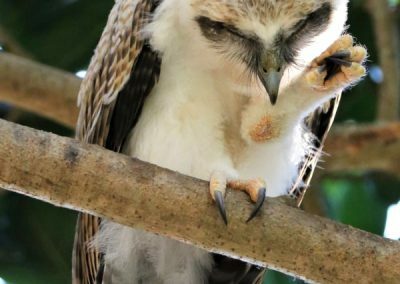 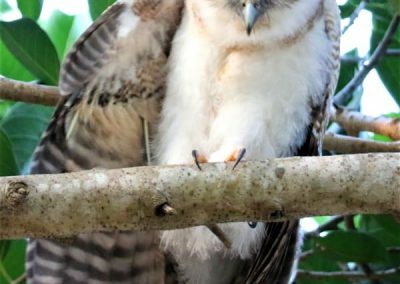 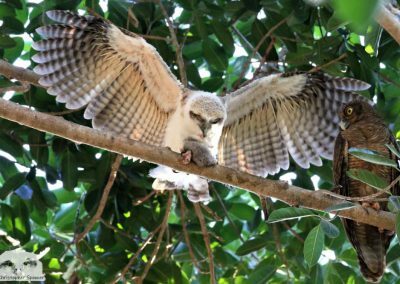 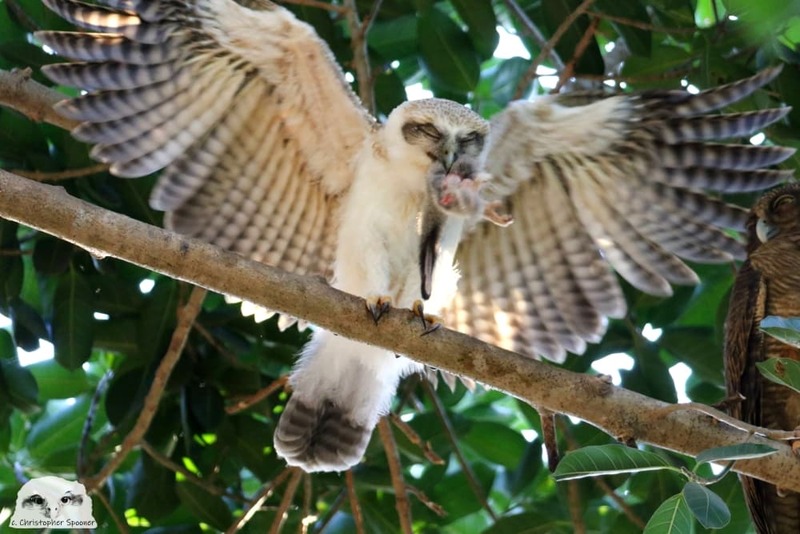 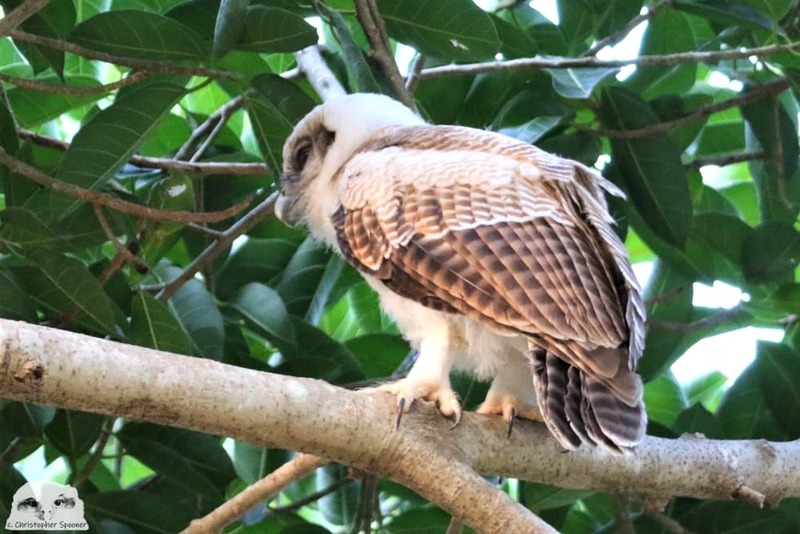 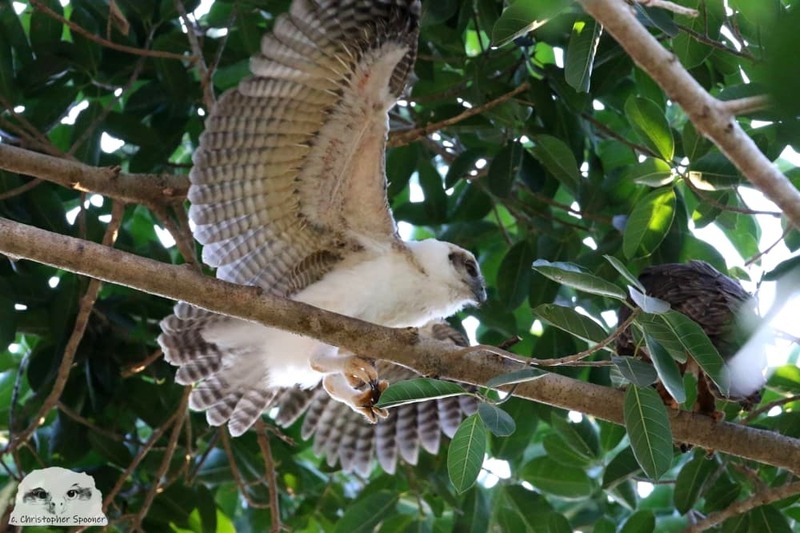 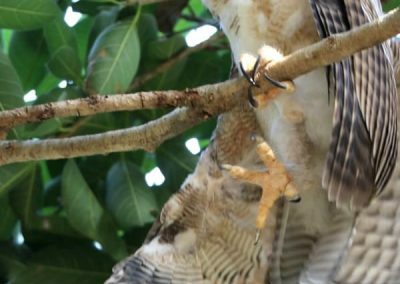 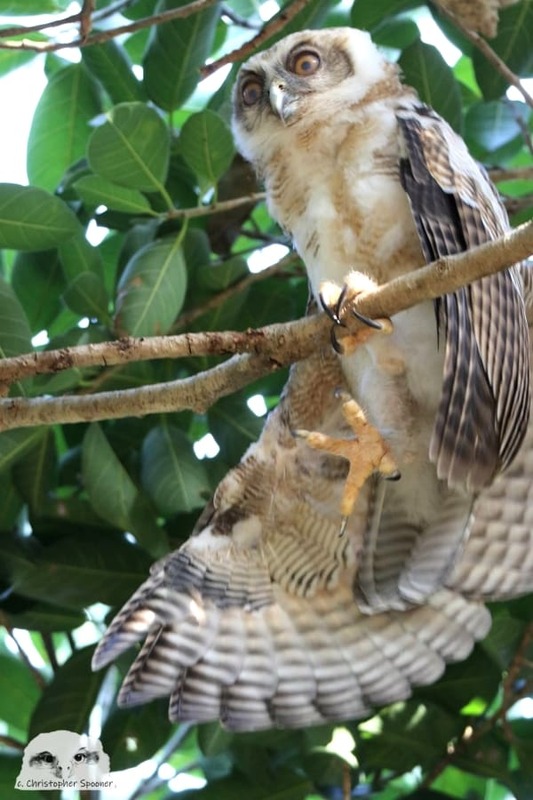 In consultation with Christopher, we decided to publish these Rufous Owl images here on this blog, so they can provide a resource for scientific study, wildlife care, interested observers, land managers and anyone active in the care or conservation of this vulnerable tropical owl. 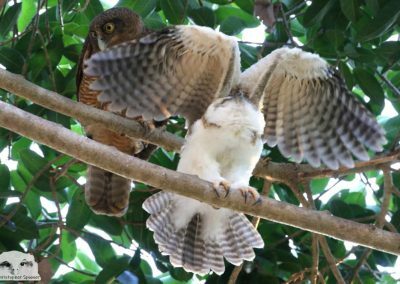 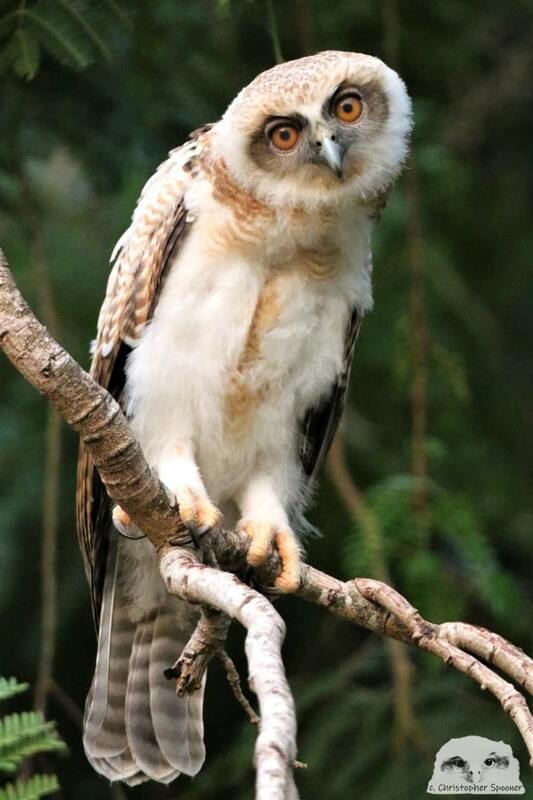 Rufous Owls are rare and uncommon in Australia. 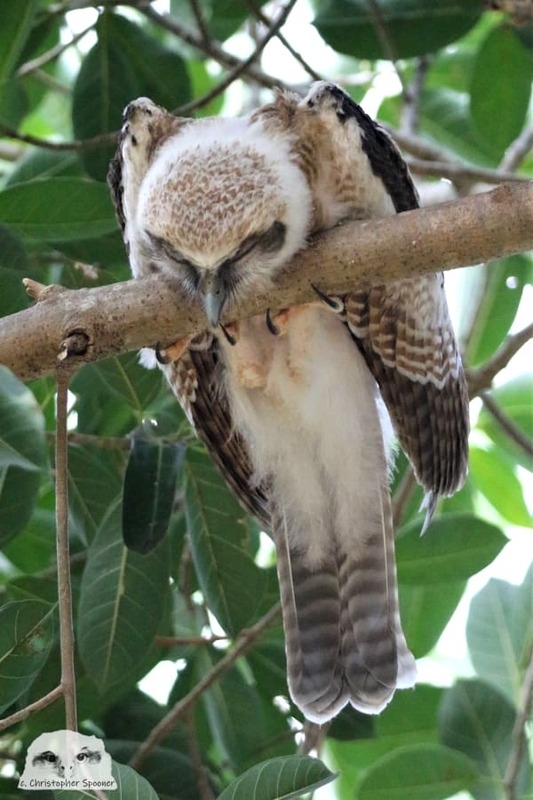 Their range is tropical Northern Territory, WA and Queensland – but there are very few reliable sites to see them. 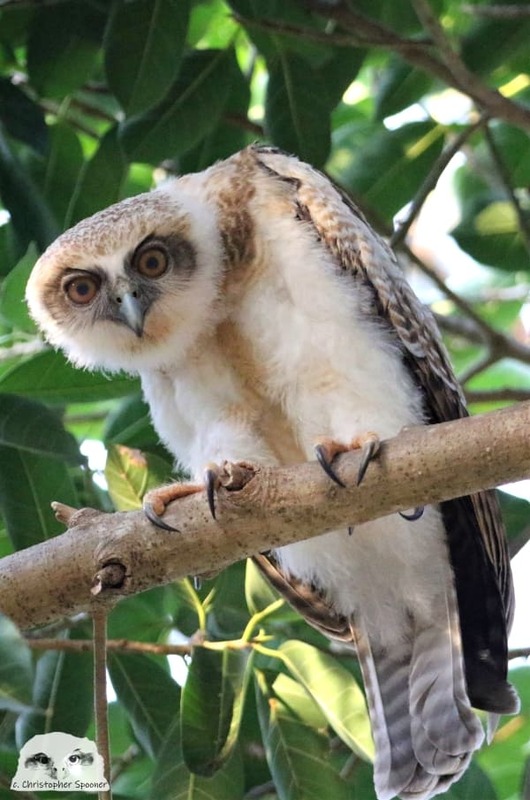 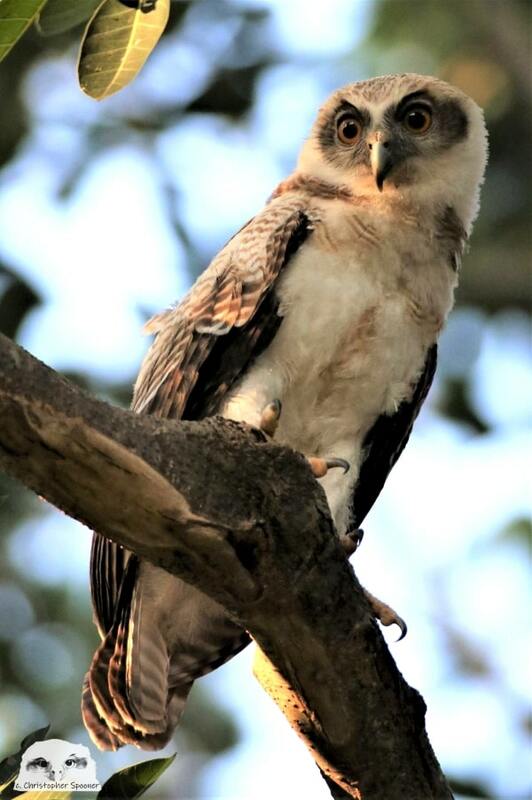 They are considered Least Concern by the IUCN Red List and the Northern Territory government, but the population is suspected to be declining, and population size is unknown. 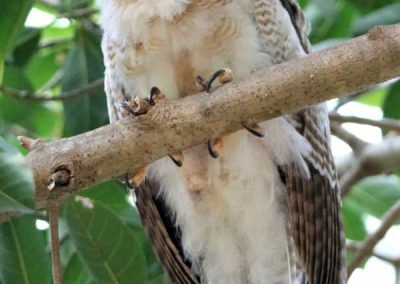 The captions on the images are all Christopher’s. 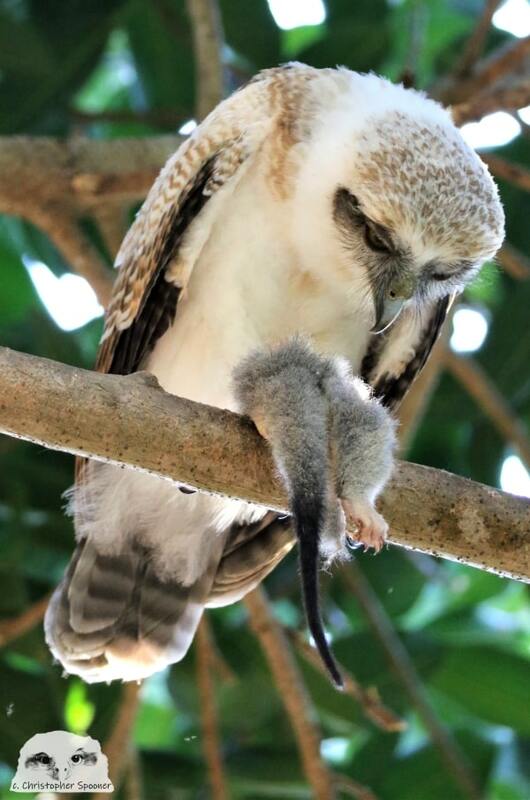 I have included some of our images of the baby owl as well, to add to the record. 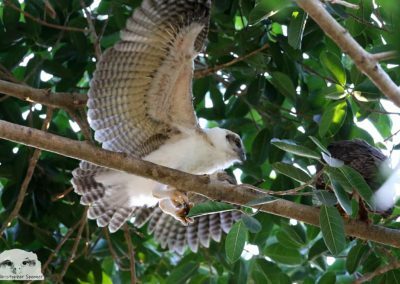 Note: Christopher was not looking for a nest, and was just lucky to be there when one of the adults flew to it. 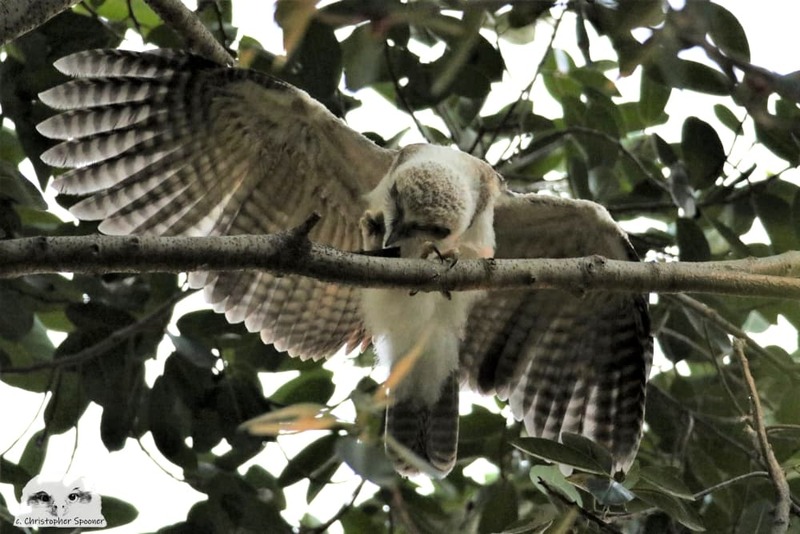 He was very cautious not to get close to the nest. 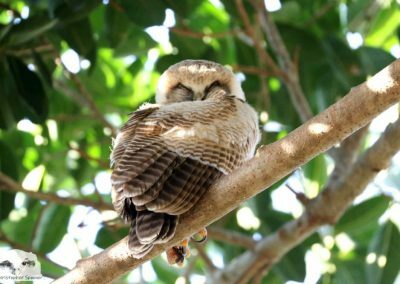 He kept this visit time to a minimum and did not return until a week later. 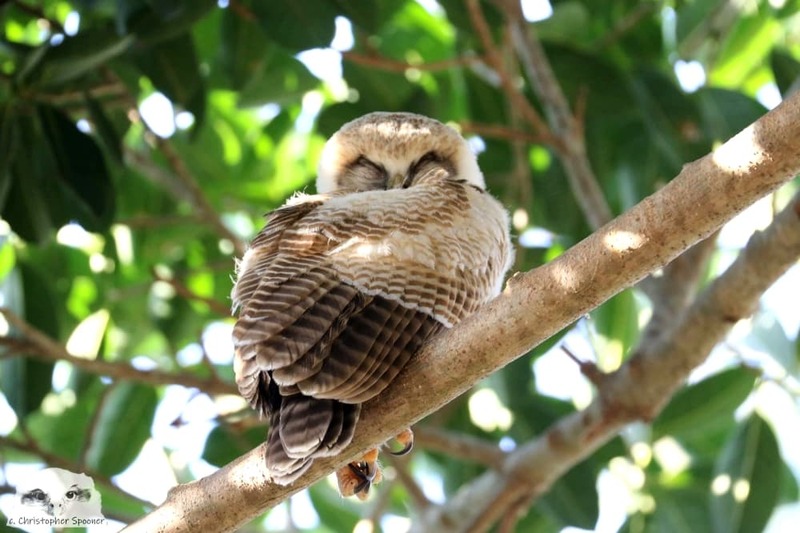 It is very important to limit disturbance at nest sites of all birds, especially rare birds like Rufous Owls. 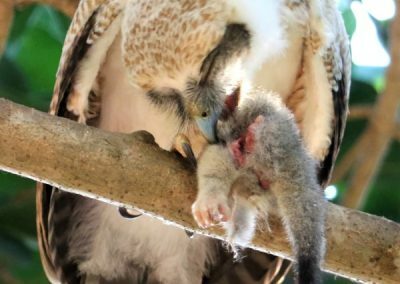 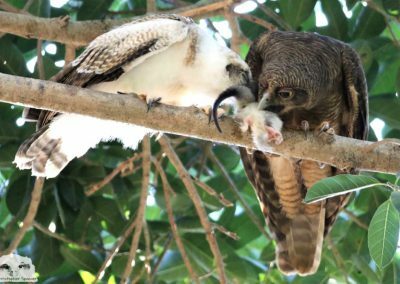 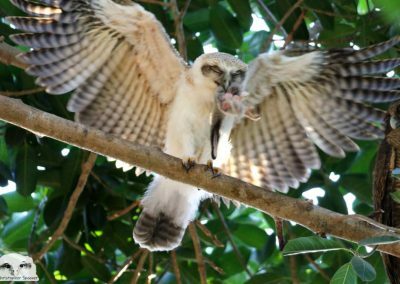 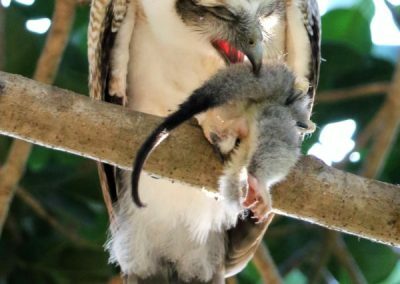 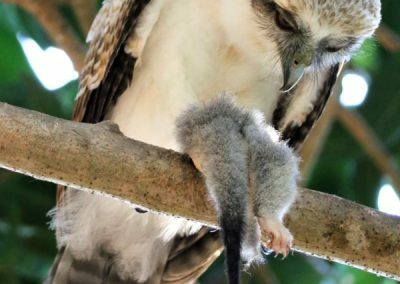 17 September 2018: Owlet 2 months old (63 days old +/- 4 days) Mother brings a Northern Brushtail prey item. 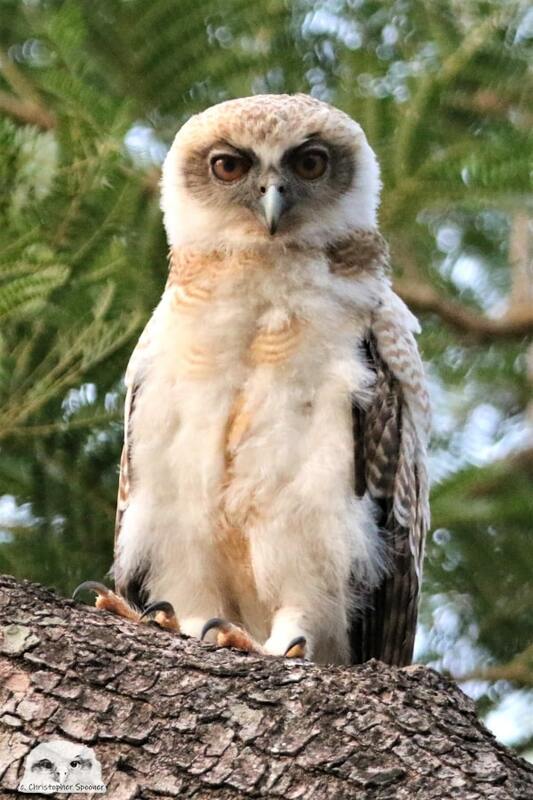 A late evening shoot, so quality is a bit poor. 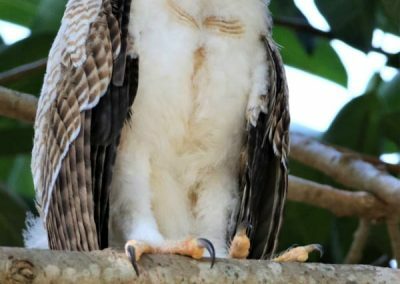 Wing feathers are developing. 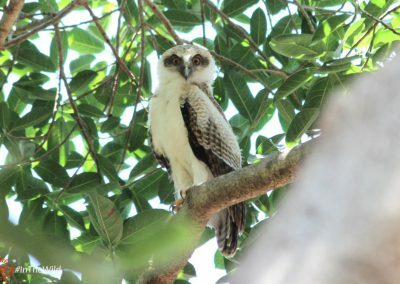 My last sighting… way up high in a tree, eyes closed against the sun, and swaying about in the strong breeze. 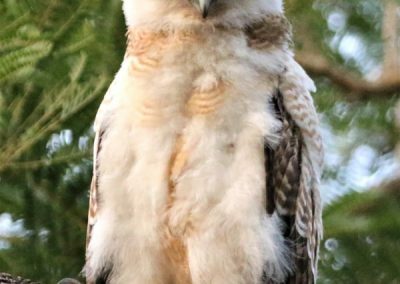 Front is very coloured and almost no baby fluff left now. 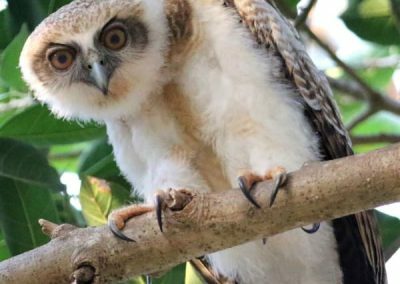 The contribution that regular citizens can make to conservation of wildlife is profound. 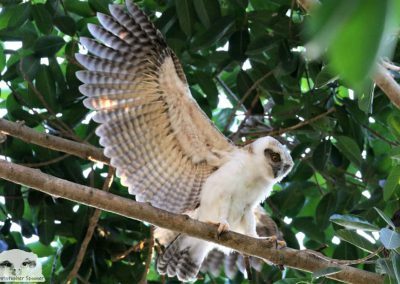 The growth of citizen science databases like eBird and iNaturalist have shown the accuracy and breadth of information provided by ordinary people. 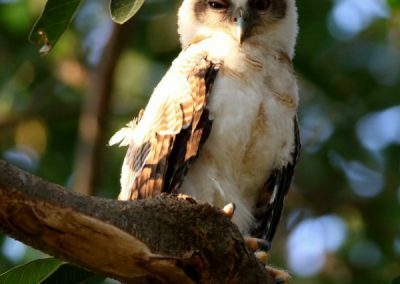 That data is now heavily used by scientists and land managers. 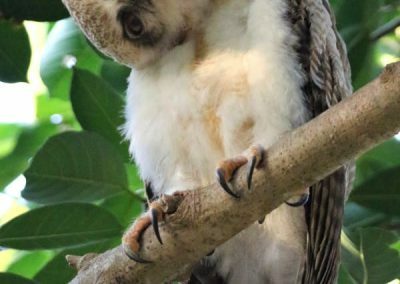 Please, for the sake of wildlife, take a photo. 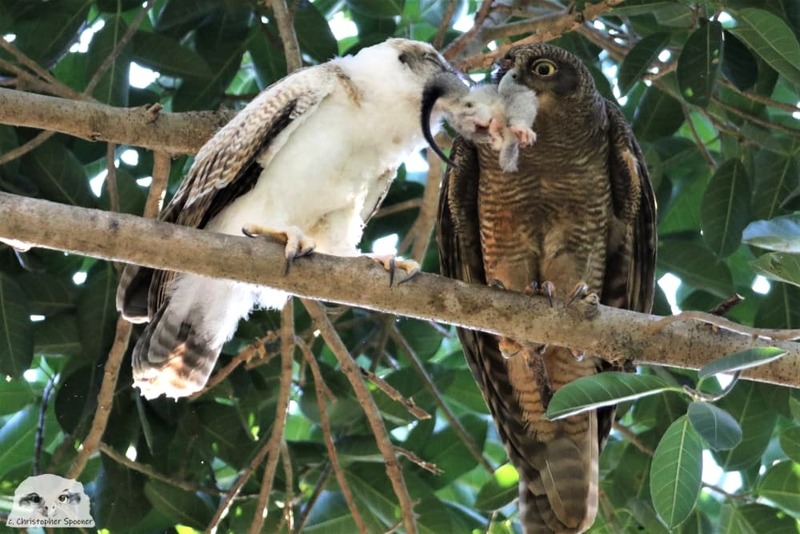 Publish it somewhere, give a date and a rough location (do not give precise locations of nest sites). 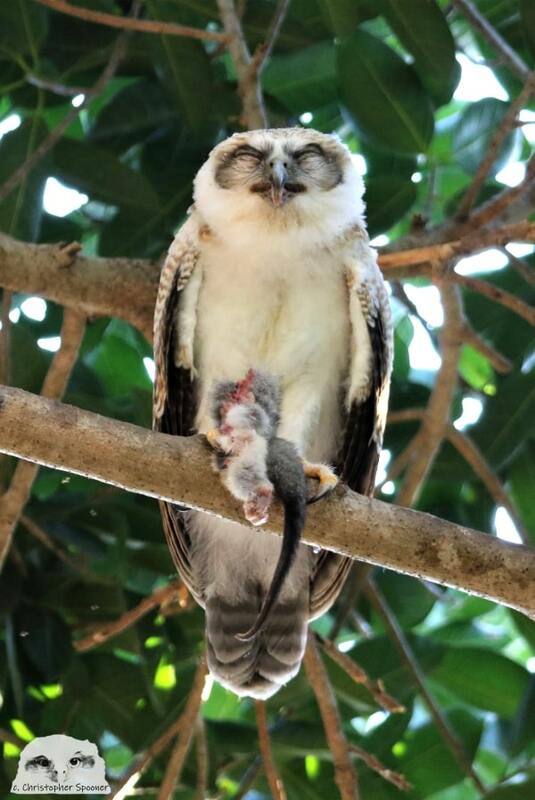 You never know how it might help. Note: be very cautious of taking photographs of nesting birds. 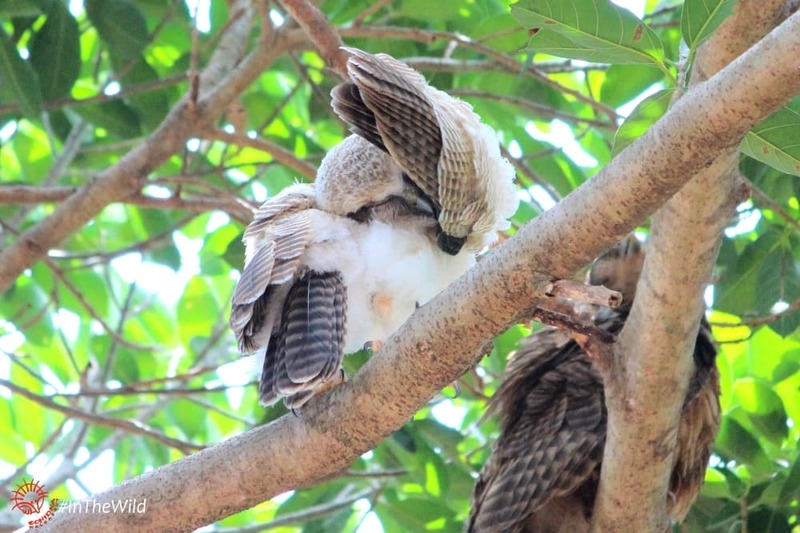 Due to bad behaviour by some photographers, photos of nesting birds are banned from many online groups. 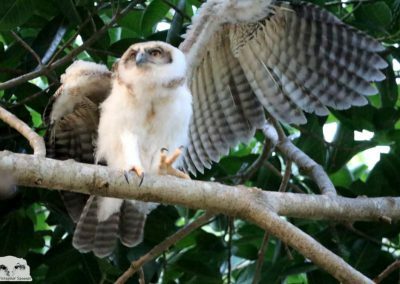 Read BirdLife Australia’s policy here. 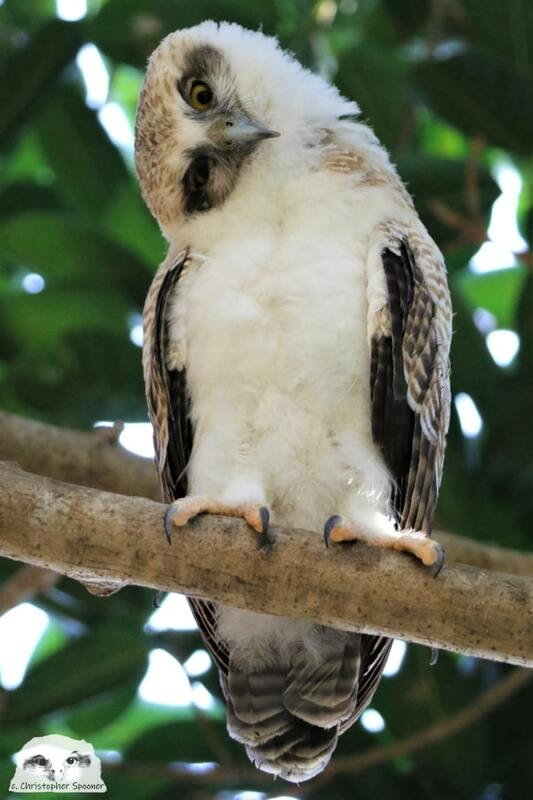 Atlas of Living Australia: All living things in Australia. 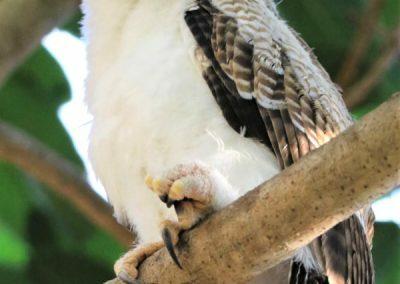 Photos can be uploaded, best if you know the species. 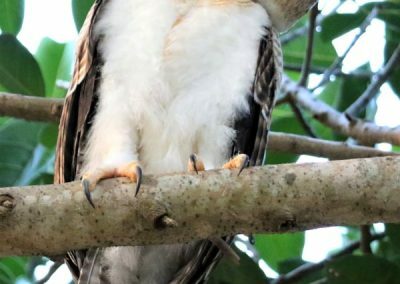 eBird. 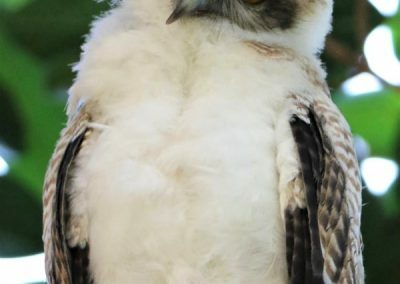 All birds worldwide. 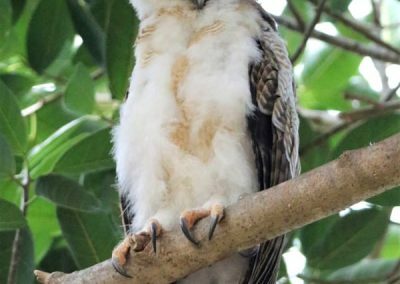 Single observations can be recorded, best if you know the species. 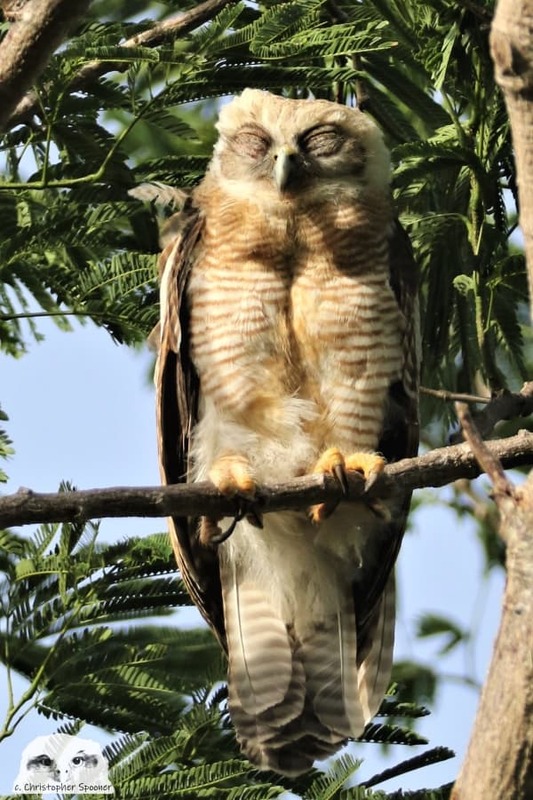 Works on a list system – so you submit a list of all the birds you see in a location. 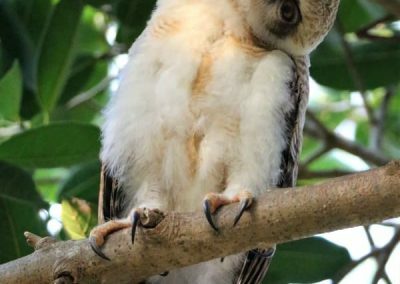 iNaturalist All living things worldwide. 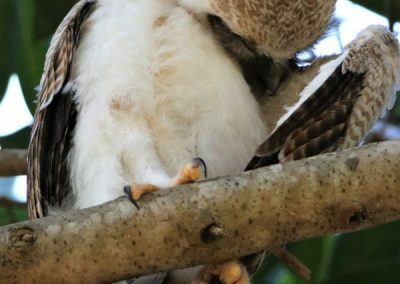 Upload a photo, and even if you have no clue what it is, an expert will check and offer an identification. 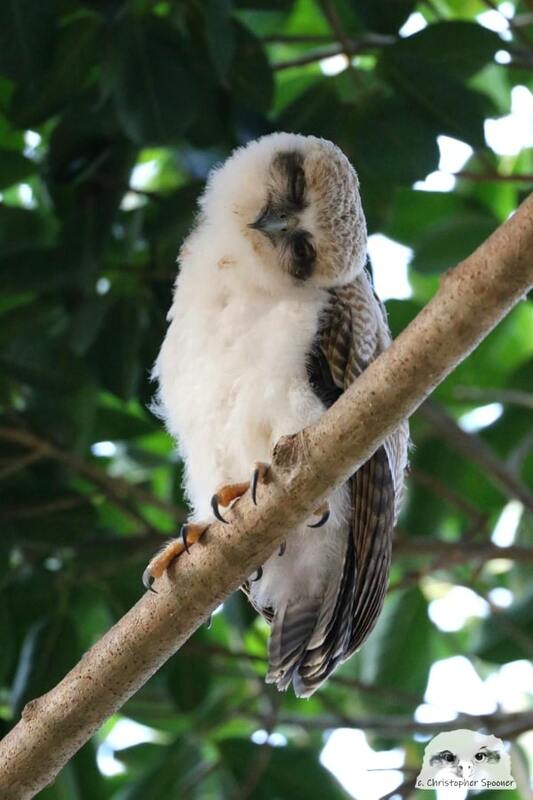 Birdline All rare birds, and birds outside of their normal range in Australia. 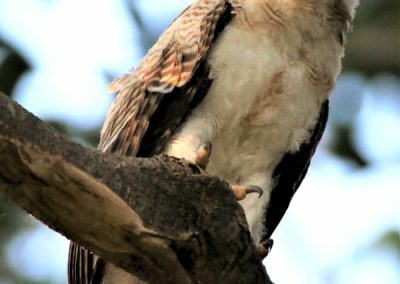 You can – and should if possible – upload a photo. 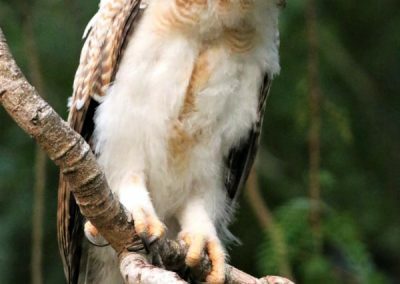 Best if you know the species and know that it is rare or outside its range. 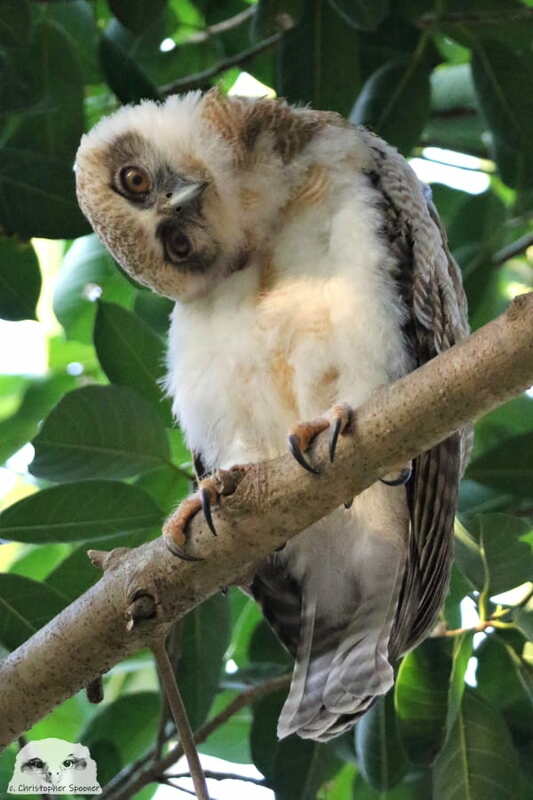 A moderator/expert will check, but they are volunteers so best not to trouble them unless you are pretty sure. Thankyou to Christopher Spooner for taking these images and so generously making them available for the good of the birds.